Nottinghamshire County Council uses CCTV cars to enforce parking outside of schools. 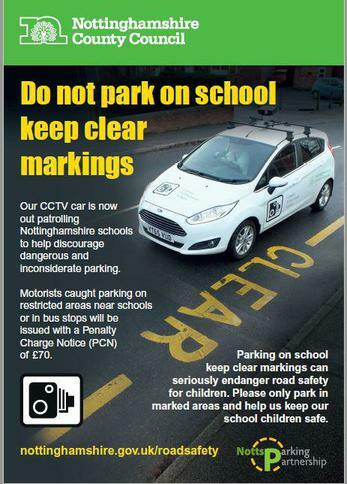 They visit every school in Nottinghamshire with parking restrictions and they record whilst passing the details of any cars parked illegally. The vehicle owners will receive a Penalty Charge Notice a few days later and many of these have been sent out as a consequence of using the vehicles. Parents are politely reminded not to park on the restrictions outside of the school in any circumstances. These restrictions are in place to provide a safe area outside of the school where the children will gather or cross the road and we ask for your help in keeping this area free of parked vehicles. The school can request enforcement from the car so if you have any concerns regarding parking please notify us (we have arranged for a visit! ).